This image is actually made of several pictures. Taking a few moments to look at it closely can reveal a lot about your personality traits and the way you think. Study the image before moving on (no sneaking a peek at the answers) to learn more about how what you see relates to the way your brain works. Which animal or animals did you find fastest? How quickly were you able to identify other animals? How many and which animals did you find? The animals you found first offer insight into your personality traits. People have long thought that animal choices say a lot about your personality, but new scientific studies show there are differences in the personalities of people that prefer different animals. 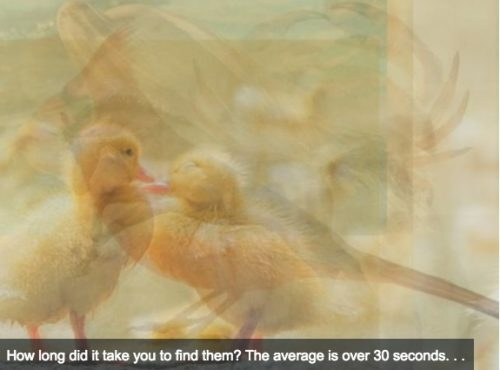 Which animal or animals your eyes were drawn to fastest in the image can reveal details about your personality. The Bird – If the first image you saw was the bird, you tend to have a more outgoing and expressive personality. The Crab – If you saw the crab first, you tend to be happier and have a better sense of humor. 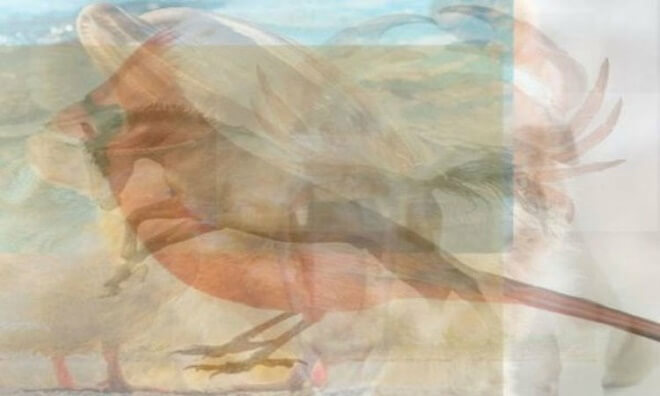 The Bird & The Crab – People who saw both images at the same time or very close together tend to be more sensitive and emotional. 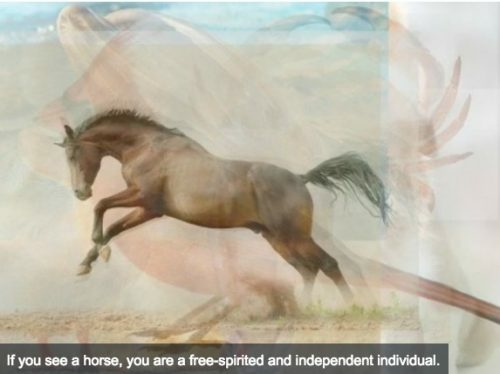 The Horse – This image usually jumps right out at people who are more independent and free-spirited. The Dolphin – If the dolphin was your first image, it means you are a more creative and artistic person. The Ducklings – This image can actually be difficult for many to find. Seeing it first means you are detailed, quieter, and more focused. 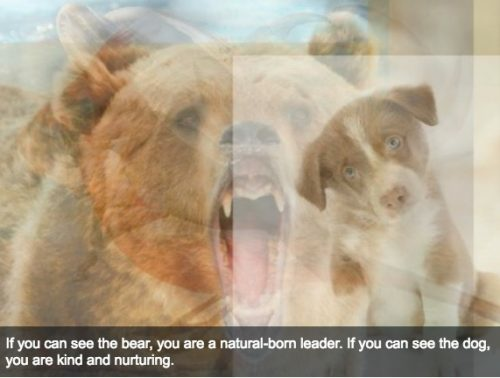 The Bear – Seeing this growling beast means you are a natural-born leader with a strong personality. The Puppy – If the puppy was the first animal you saw, it means you are kind and nurturing. This works to identify your dominant personality traits because your subconscious mind plays a role in determining which animal you see first. This is an example of convergent thinking. Psychology Today defines convergent thinking as the ability for your brain to naturally limit the choices it can think of. Convergent thinking relies on instinct and preferences, making the first item you see the one that feels most natural to you. It reflects your inner beliefs and desires. This exercise can also uncover more about the way you think. In his book “Thinking Styles” psychologist and college professor Robert Sternberg talked about the fact that people think differently and that it affects how they learn, work, and interact with others. How quickly you identified other animals and whether you were able to see all of them can help identify your thinking style and mental agility. While the traits of the animals you saw first related to your characteristics, the way you focus on the images is related to how you think. Finding the bird and the crab requires focusing on contrast. If you were able to find both of them quickly, your brain processes information very quickly, and it is easier for you to spot connections and patterns. Seeing the horse was more difficult. Finding it at all shows an ability to stick with it and look deeper. Those that spotted it easily are intuitive, deep thinkers. 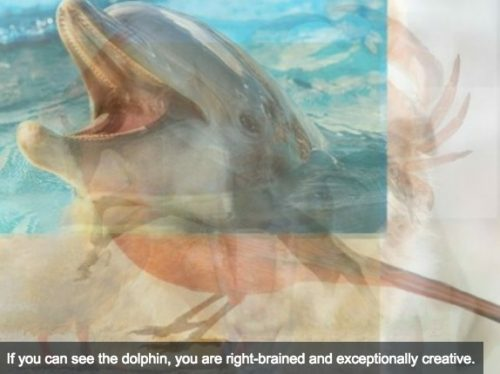 Finding the dolphin's image requires a different type of thinking altogether. To see it you almost have to relax your eyes. This indicates the creative, expressive thinking often attributed to the right-brain. Seeing the bear requires a thinker with the ability to look at the big picture and not be caught up with other details. So what does it mean if you were able to find all seven animals? The more animals you found, the greater your ability to think divergent instead of convergent. That sounds complicated, but divergent thinking is just the process of finding more options. If you found four or more animals in the image, you're already well on your way to becoming a divergent thinker. Studies show that divergent, creative thinking offers many benefits. Divergent thinkers learn more easily and solve problems more creatively. Only Highly Perceptive People Can See The Correct Image. Can You? This Classic Optical Illusion Will Assess How Creative You Really Are!